Located within the mountains of Almeria in Spain sits Europe’s only semi-desert, a surreal landscape of arid slopes, dry river beds and ravines known as the Tabernas Desert. While the name of the desert might not strike many as familiar, the landscapes probably will; this area is a Hollywood favorite — it’s been featured in "Indiana Jones and the Last Crusade", "Lawrence of Arabia" and the Clint Eastwood "Dollars" trilogy. 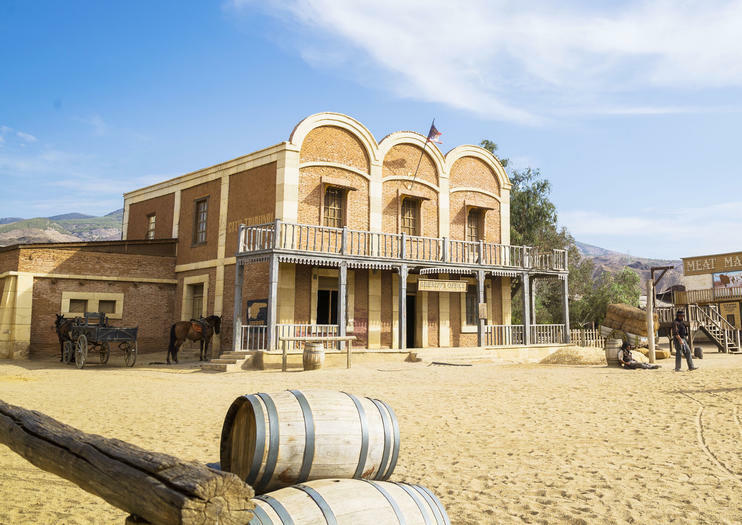 Movie buffs can walk in the footsteps of famous actors in the film villages of Fort Bravo, Mini Hollywood and Western Leone, some of the more than a dozen villages built in the desert for filming purposes. Visitors will also find hiking trails, ruined hilltop castles and plenty of stunning desert views. The nearest permanent settlement in the area is the village of Tabernas, located to the southwest of the desert. Another option for a base is Gergal to the north. Spend the day discovering Mojacar, a historic whitewashed village of Moorish origin, on a full-day tour from Roquetas de Mar. On an air-conditioned coach, you’ll travel through Cabo de Gata National Park and Sorbas, famed for its gravity-defying houses, before arriving in Mojacar. On a sightseeing tour, you’ll see Old Town highlights such as Plaza Nueva and the statue of La Mojáquera before you stop for lunch in the fishing village of Garrucha. Hotel pickup and drop-off are included.